Psychologist G. Stanley Hall famously described the teenage years as a “storm.” But the teen tempest is foreshadowed by some early storm warnings during the tween years: unsettling new behaviors such as blatant eye rolling, public back talk and peer worship. These wearing attitudes darken the horizon like threatening clouds during early adolescence—and make parents want to run for cover. If storm clouds are brewing at your house, don’t batten down the hatches. Take these steps to tame unruly tween ’tudes, starting today. How to help: Recognize that it’s not (always) about you: “Parents can take their child’s attitude personally, when the behavior is more of a general statement about all authority,” says Schafer. Treat an eye roll or a slumped stance as an invitation to uncover what’s genuinely bothering your child. How to help: Back talk shouldn’t be ignored, because it signals an underlying problem (even a minor, fleeting one, such as frustration over a missed soccer goal). But shooting back more angry words only fuels the fire. Responding with “I can see you’re upset right now. Let’s take some time to cool off. Do you want to spend time alone, or would you like me to stay with you?” gives both parties a chance to step away from the problem and regroup. Once tempers are diffused, raise the issue in a neutral tone and work toward resolution, recommends Suzanne Roberts, a licensed family therapist in Seattle. You’re buying popcorn at the movies, sitting down at a restaurant or leaving a school function when it happens: Your tween unleashes a defiant diatribe that makes heads turn (and your stomach drop). All eyes are on you — what now? Public parental humiliation is a time-honored tween tactic, because tweens know that parents may be more likely to cave in the glare of the spotlight. “I don’t know any parent who hasn’t had this happen to them,” says Roberts. How to help: Too often, parents react to the shame they feel instead of the actual situation at hand. “We’re afraid of being judged by strangers,” says Roberts. Instead of getting burned in the heat of the moment, cut the outing short and remove the child from the situation. Hear your child out when everyone’s anger has mellowed and provide a logical consequence (such as, “The next time you want to go to the mall, we’re not going”). Prevent these trying scenes in the first place by setting parameters for the outing before leaving the house. Decide in advance how much money will be spent, how long you’ll stay and what constitutes acceptable behavior for the trip. Living with a mercurial, moody tween is no picnic. One moment, your child is a sunny sweetheart. The next, a rage-filled zombie. But don’t blame your child — blame biology. “There’s a growth spurt in the brain around ages 11–13 that affects mood and behavior,” notes Roberts. With rapidly changing bodies and minds, kids lack the impulse control and emotional regulation to deal with stress adaptively, and lash out at parents instead. How to help: Don’t try to solve a problem when kids are at the unpleasant end of the mood spectrum. “When we’re angry, our brains are taken over by a fight-or-flight response, and we can’t respond appropriately,” says Roberts. 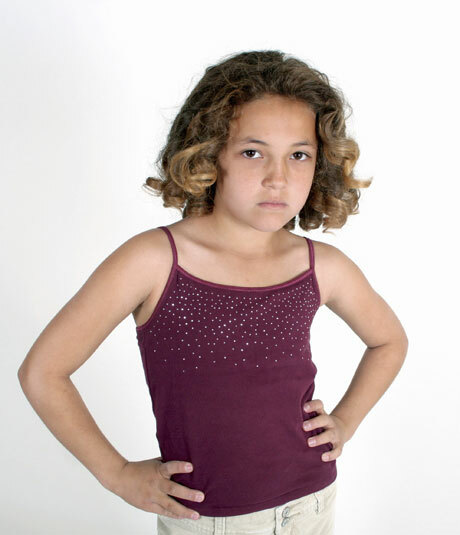 Ask your child to put a numerical value on their anger, from 1 to 10, and make a family rule to take a cooldown break if anyone tags their fury at 5 or higher. You used to be the epicenter of your child’s life, but lately, there’s a new focal point: peers. These days, your child is dressing, talking and acting more and more like her pack of tween pals. Worse, she seems to prefer their company to yours. What gives? To maintain a strong connection that will stand the test of peer power, try meeting tweens where they are: chatting, texting, sharing computer games, shopping, or by simply listening. Malia Jacobson is a Tacoma-based journalist and mom. She blogs about family health at thewellrestedfamily.com. Listen without replying Really hear what your child says and accept that it is their reality. They may have a chip on their shoulder or a grudge they are bearing. Find out what it is. Create a signal Decide you want more mutual respect in the family. Create a signal — like touching your nose — to employ when either party feels disrespected. Solve problems View discipline issues as problems that need solutions instead of children who need punishment. Have family meetings and ask tweens to contribute to household rules. Kids are more likely to comply with rules they help to set. Strengthen bonds Think back to a time when things were going well with your tween. Where were you? What were you doing? Create more of those conditions and rituals to build a stronger bond. Source: Alyson Schafer, psychotherapist and author, Ain’t Misbehavin’.